Our research interests are in synthetic organic chemistry and the contribution that this science can make to the fields of medicine and natural products. We concentrate on developing new methodologies for synthetic organic chemistry and asymmetric synthesis and then employing our chemistry to make biologically-important natural products. Our work is directly relevant to the pharmaceutical industry and the research group is supported by multi-national companies including Merck, AstraZeneca, GlaxoSmithKline, Eli-Lilly, Novartis, Roche, Aventis and Pfizer. The facilities available for research in our labs in the CRL are second to none. The research group consists of three part II’s, two SBM rotation students, ten DPhil students and four postdoctoral assistants. We meet two/three times per week to discuss advances in the laboratory and hold problem sessions to highlight recent developments in the literature. We are an active and vibrant research group with a positive dynamic and friendly atmosphere. Excellent support is given to new part II’s and DPhil students in the form of mentorship by senior group members. 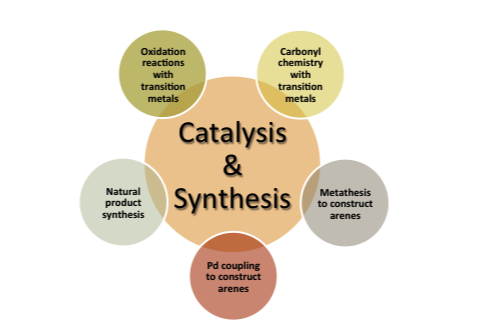 Our research interests are wide ranging, encompassing osmium-mediated processes, Birch reduction of pyrroles and pyridinium salts, carbohydrate chemistry and ring closing metathesis as a strategy for the formation of aromatic heterocycles. With each new method that we develop, we are also keen to show that it is useful in total synthesis. In this regard, the group has built up significant expertise in the synthesis of natural products; some of our current targets are shown in the research pages of this website. February 2019 - Congratulations to Dr. Roly Armstrong who won a prize for his talk given at the Departmental Syngeta Postdoc Symposium. October 2018 - A paper from the group has been accepted in Nature Chemistry; well done Alex, Hamish and Philip. January 2018 - Tim was appointed chairman of the executive board of editors for Tetrahedron publications. November 2017 - Congratulations to Timothy Kwok for winning a Lilly prize for Excellence in Organic Chemistry Research. October 2017 - Well done to Wasim Akhtar for winning one of the prizes in the AZ sponsored final year DPhil talks.